The Ayurvedic use of the word marman (acupoint) is synonymous with the word varman in South India. Dravidia refers to the regions of South India and includes the spoken languages of Tamil, Kannada, Malayalam, Telugu, and Tulu. There are three subgroups within the Dravidian linguistic family: North Dravidian, Central Dravidian, and South Dravidian, matching for the most part the corresponding regions in the Indian subcontinent. Dravidian medicine includes much of Ayurvedic theory, but also recognises distinct varman therapeutics. Dravidian practitioners have identified two main groups of varman, supported by classical Dravidian texts on Siddha medicine and varman techniques. This grouping of varman is not found in Ayurvedic theory, although both systems philosophically agree upon a common source of varman. According to Dravidian theory, these two groups are believed to incorporate the entire nervous system of the human body. “Padu and thodu varman allows the intangible signs of life (such as the mind, desires and intellect) to manifest within the life-centres of the body, and to express action in the world” (Nair, interview, 17/9/98). The Dravidian Siddha theory concerning the 12 padu varman and their relationship to the 96 thodu varman demonstrates an important addition to the theories commonly held by Ayurvedic practitioners. This information is significant to Ayurvedic theory when attempting to understand the relationship between groups of marman and their theoretical role in maintaining balance in the human body. The importance of Dravidian varman theories is further highlighted by the opinion of scholars who hold that the Dravidian text Odivu Murivu Sara Suthram by the sage Agastya is likely to predate the records of the Ayurvedic author Susruta. 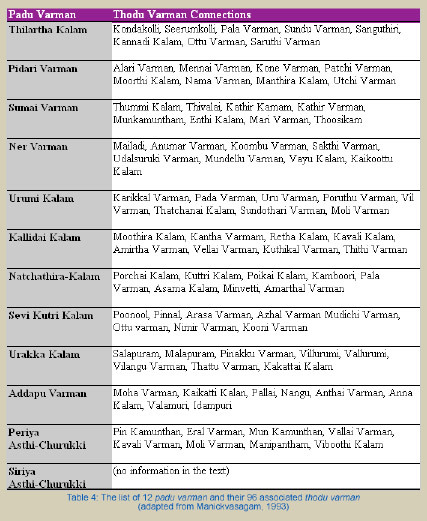 The Dravidian text Odivu Murivu Sara Suthram holds that the three kalai (primal influences of kundalini – Ida, Pingala and Sushumna) support the 108 varman as three groups of four padu varman and 12 groups of eight thodu varman (see table 1). According to Dravidian practitioners, the 12 padu are considered to be very important, and of these, three varman are believed to be the most important. They are identified in Sanskrit as basti, hridaya and sthapani marman and are believed to be the three “root” marman associated with the “tripod of life”(See fig.1 left). The three marman – basti, hridaya and sthapani – correlate with the Chinese points on Ren and Du mai. These points are guanyuan (Ren4), shangzhong (Ren17) and yintang (Du24.5) respectively (see Figure 1 right). These three points are important energy centres in Chinese theory. They are significant in Daoist health exercises, as well as Chinese martial arts and alchemy, and play an important role in Chinese acupuncture. 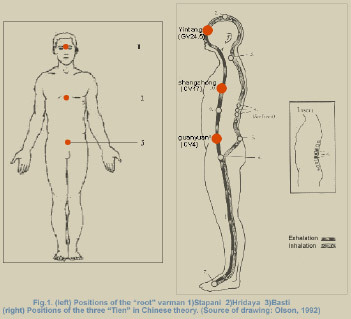 There appear to be similarities between the Dravidian concept of the three primary channels “supporting the 12 padu channels” and the Chinese idea of the three primary (ancestral) channels of Ren mai, Chong mai and Du mai, “giving rise to the 12 channels of the body”:Chong mai and Ren mai originate from the inside of the uterus, a branch rises up in front of the spine, making the ocean of the twelve meridians (Huang Di Neijing Lingshu, Chapter 65, quoted by Matsumoto and Birch, 1986, p 31). This is why we can say the Du mai, Ren mai and Chong mai have different names but are all the same (Wang Bing; quoted from the Nei Jing Jie Po Sheng Li Xue; Matsumoto and Birch, 1986, p 17). 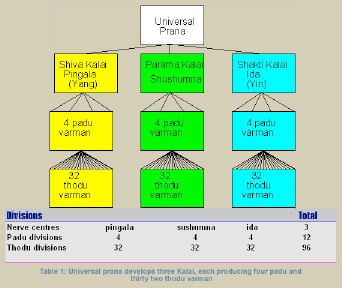 Similarly, the Dravidian view of the 12 padu varman is that they are manifested from the three energies (kalai) (see Table 1), which are believed to have a single origin – universal prana. 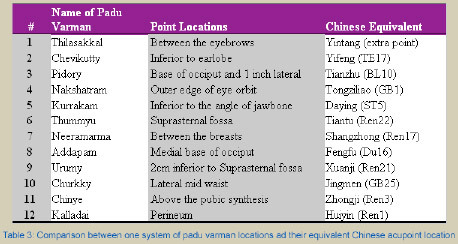 An apparent correlation between the two systems of Chinese and Indian theory regarding the origin of the channels is presented (see Table 2) and their location on the human body with a comparison to Chinese acupoints (see Table 3). Practitioners from the state of Tamil Nadu and Kerala believe that the “life centres” (chakras) were the key to understanding the varman effect. These “life centres” are also recognised in Ayurveda but they are mainly used by those practitioners of yoga who develop the kundalini, the essential energy which is said to flow through the region of the spine in the human body. 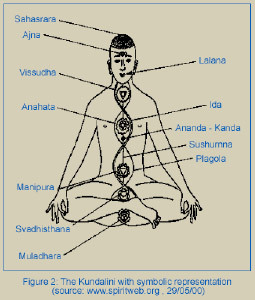 It is believed by Ayurvedic and Dravidian practitioners that the three major energy channels (kalai) which constitute the kundalini, commonly known as the Ida, Pingala and Sushumna, form the main nerve centres (chakras) in the body and are the intermediaries of marman effects. The Sushumna is said to flow up the spine and the Ida and Pingala alternate sides between the chakras, represented by the early Vedic symbol shown in Figure 2. Dravidian practitioners often refer to the theory of a central energy source in the human body. In this theory, the seven major nerve centres (chakras), which act as a plexus for the three primary nerve channels of the kundalini, make possible the effects of the varman. The network of varman is believed to exist because of an indirect connection to the source of the kundalini and its associated chakras. This connection is brought about through a hierarchy of varman which can be summarised in two primary groups, the padu and thodu varman (Nair, interview, 19/9/98). Each of the 12 padu varman collects impulses from, and distributes to, eight thodu varman. In line with Ayurveda, a total of 108 varman may also be found in the Dravidian system, although Dravidian medicine observes many additional varman. According to Manickavasagam (1993), the Tamil text Odivu Murivu Sara Suthram lists each of the 12 Padu varman and 96 thodu varman. He further claims that there are internal associations between the 96 thodu varman and the 12 padu varman: “Every padu varman point is a collective junction of eight thodu varman. That is, one padu varman contains eight thodu varman” (see table 4). Unfortunately, no systematic attempt has been made so far, either by Tamil savants or by Siddha [Dravidian] medical practitioners, to render with critical evaluation even the major Tamil texts into English. The two main reasons being the enigmatic nature of the texts and the secretive attitude of Siddha practitioners. Nonetheless, an appreciable number of texts in Tamil have been printed, although many of them are still in manuscript form, preserved in libraries in Tamil Nadu. According to Velan, there are over 700 Siddha texts in Tamil, of which 180 have been printed (Subbarayappa, 1997).